But today I headed out for a 100km TT over a course that I have done before with the goal of going under 3 hours. My previous best was 3:02. The course is boring - a 5.7km stretch of road. Hotdog turn at each end and each lap is 11.4km. The 100km is 8.75 laps (or thereabouts). The hotdog turns take the average speed down a little but at least there are no cars around. The course is more or less flat and features Port Macquarie's wonderful chip seal surface. I tried this course 3 weeks ago and pulled the pin after 5 laps. Just wasn't into it and wasn't getting it done. I was well on my way to a 3:10 or so. This week I'd had pretty much the same lead in as last time, but from the first laps I was on! In fact my first lap was my slowest, but it was still quicker than the fastest lap from last time. I kept the laps nice and consistent and at the 50km mark I was on 1:28. Kept pealing off the laps and then the wind picked for the last little bit. Had to hammer with the wind to put time in the bank for the return leg. I stopped the clock in 2:55:49 for an average speed around 34kph. Very happy given that I did it completely solo - not a single cyclist to draft off, even for a second. In all I got passed by about 15 cars in either direction. Just me and the clock. I'd been feeling that my cycling wasn't shaping up too well in the IM prep but today gives me a lot more confidence heading into the last 50 days of training. My 5:30 ride at IMOZ 2008 is now within sights - actually my wife's 5:20 is now in sight. Bring it on! Who else has had a break through session? They don't come that often so why not drape yourself in glory for a few moments and tell us about it. Superb work. I bet your time will keep tumbling from now. Did you ride that with your PT? Every day I see more vaue in them. Left the PT at home this time and put the Zipps on. Full race set up. I'd like a PT on aero wheels but can't do that at this stage. I did have a PT laced on to HED Alps but crashed and wrote off the HEDs Got the PT built into standard training wheels. Training with power but will race without it. Consistent laps today indicates that I'm getting a good handle on measuring out the power over 100km. I have a very similar story to yours which includes a 100km TT i did last Sunday. Back in October me and a mate did the 100km TT on a perfect road 50km out and back, race setup and charged ready to go. I was unsure what to aim for so just rode like my life depended upon it. There was no drafting, but from time to time i would catch him or he would catch me, normally on the hills. But we would pass one another very quickly. I did a time of 2:36:46, avg speed of 38.3 km/hr. Avg HR 159. Avg Cadence 84. I was wrecked, I didnt use my gels wisely and kinda bonked at the 95 km mark when i got passed the last time by my mate. It was a learning experience. The conditions were absolutely perfect. The TT was only suggested on the thursday and i was working the saturday night 12 hours finishing at 6 am, for a 7 am start of the TT. There were 5 riders all up, 3 going hard, me going 90% and another wanting to draft the whole way. I wasnt going to go hard but just wanted to either jump on my mates (stu) wheel or ride at 90%. This idea was shelved as another mate (simon) wanted to jump on a wheel so i said he could jump on mine and id do a 95% ride and see how things go. Setting off with someone on the wheel is kinda sorta motivating. No way of slackening off as i was dragging him along and didnt want to ruin his ride, but knew after a night shift i wouldnt be able to perform to maximum. The bike felt great all the way along the ride, fuelling went well, and i caught the first 2 guys before the 60 km mark. I knew i was on fire at this point. I had worked hard on my cadence for the last few months and it was great at about 90rpm. My HR was sitting around the 152 mark and i was feeling great. at about the 85 km mark it began to rain and a spot of hail, it was a perfect way to cool me down. At the 90km point the last of the long hills starts and so did the head wind. I was feeling pretty shot at this point but trucked on. Simon headed home at the 95 km mark and i did the last 5 km flat out knowing that if i pushed id beat my previous time. I did a time of 2:32:38, avg speed of 39.3 km/hr. Avg HR 154. Avg Cadence 93.3. Considering the fatigue from the night shift, and the head wind i really wasnt expecting to ride so well. What i learnt was fuelling helps alot, aero wins over power (i stayed aero for pretty much the whole 100km), having someone on your wheel can be motivating but also may extend you too far on race day, and high cadence is king. By looking at my Avg HR, maybe i was only pushing to 90%. Both rides were with tri suit, 50mm Mavic Cosmic Carbone Wheels and Aero lid. Now what to aim for at Port? This is my breakthrough session. My thanks go out to AP for mentioning this TT session over on trannies, and my mum and dad for being just like parents to me. Cameron, not sure that is the best mindset, especially for number one IM. Target an effort or output, not a time. Plenty of stories of people frying themselves trying to stick to a schedule. I have, Alex has, I am sure there are plenty of others. Agreed that a time isnt the best to be aiming for, I am going to be using a HR as a stopper. Its the wife and kids who need to know a time so they know where to be and at what time. She is a mean woman and if i dont keep to the schedule ill be punished. The kids can handle cheering everyone on but the wife is very impatient. She even said to me could i get faster so the day isnt so long. Im thinking of setting my max HR for the IM at 154bpm, which was the average for the 100km TT. opps, get back on topic. Fair call. I do the same thing. Make sure you take your kids through the chute. Alex will get cranky if you forget. Well, I had a mini breakthrough today. I was supposed to go for a 4 hour aerobic ride, but open roads in this weather are not on my agenda. So I took the TT bike to Parramatta Park, wore what I plan to race in at Huski, plus my Huski bike nutrition plan, plus an aid station in the back of the car for profile bottle water top up. And set out on an 83km TT sitting on the bars for absolutely as much of the distance as I could manage. When I netted out the quick stop at the 50-odd k mark for water top up and another for a loo break (neither of which will be needed on race day ) I averaged 29.0 for a ride time of 2:51:00. This is about 8 minutes faster than last year's Huski bike time. Given that it bucketted for the first hour and the road was slow and gritty and I was running low tyre pressures, I was satisfied. It may not rival Ratty's feats, but this old woman is feeling quietly confident about a better overall time second time round. It would be really nice to have an AG 1st on the bike - this is feasible, but no hope on the swim or run. Mick B wrote: Fair call. I do the same thing. Make sure you take your kids through the chute. Alex will get cranky if you forget. LOL, If they dont want to wait around for me they can head down it with him. Gillian, Thats a damn good speed for Parramatta Park. And to be able to stay on the aero for most of it in the rain means you have a bit of guts. That hill can be a killer from time to time. Keep up the positive attitude, and remember your racing your peers or the clock, not young blokes like me. Sounds like your breakthrough session was today but more importantly the training done over the last few months which has reinforced what your body has been telling you. Your strong. I like those days where your just gliding along and it feels absolutely effortless. Runners call it the "runners high". Not sure what happens, but everything just connects, your mind completely tunes out of your surroundings and your pace is in fire yet it just feels soooo easy. It's almost like your in a trance or something. A follow up to my breakthrough session. 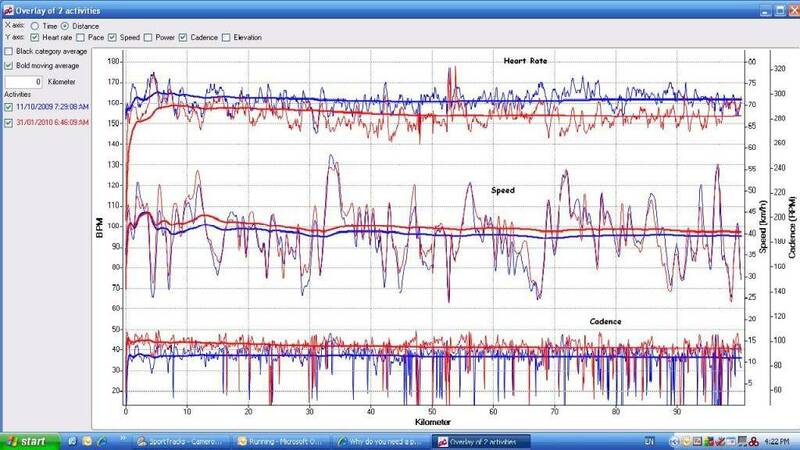 Ive done some analysing using Sporttracks and these are the graphs of the same TT but on different dates. Is that session right up near your threshold or at IM pace? That is a smashing TT. I did the TT with the thought of being able to find out where I am at leading into the IM. I pushed about 90% effort, but saying that i had done a 12 hour night shift ending only 1 hour before the start of the ride. From this run (red lines) i will be looking at averages and see where i should be putting my limits for the IM. Yes i know i should already know and be training with these figures in my head, but im self trained and pretty slack with discipline. Any help with setting these limits would be great. I am sure Fluro, Alex or Glenn can help. Heart rates are very individual so I wasn't sure what your ~160bpm ave represented. I was just wondering how close you were travelling to your threshold. Regarding what is appropriate for you, as an example, 160-163bpm is about my 1 hour best average, and Fluro thinks my 140 IM heart rate should be 135 or even 130. I am going to do some TT work tomorrow at 135 instead of 140 and see how I feel afterwards. As you can see, the IM zone is way below threshold. As another example, I think Harris rides below 130bpm in IM's and he has gone to Kona. Saving it all for the run. You have a declining HR profile. This is not good in terms of setting up some pacing guidelines. Even though you did these TT’s at 90% in terms of execution you want to see that HR profile on a slight incline. If you can’t then your pushing too hard too early, which means your power towards the end will be much lower. If anything even though you were slower on the first test, you executed the TT closer to your potential (ie current abilities). In saying that there is very little decoupling going on between your HR line and your speed line, so you have come very close to executing your second TT well. It’s when you see your HR line and speed line seperating then that would indicate poor execution. If you have a look at your blue HR line there is a slight indication from about 70km that it begins to rise and so does your speed. It shows your coming home strong. However, on the red lines from about the 80km your speed is fading, could be just fatigue from your night shift. This is also confirmed with your speed being lower on your peaks and troughs compared to your blue line from about the 80km mark onwards, but at the start of the TT your riding faster in both the peaks and throughs. Notice too the gap in speed between the blue and red lines at the end of your TT. You want that to be wider, to show developments in muscular endurance. Maybe that is your limiter??? I wouldn't even take a guess at your IMHR's unless you know exactly what your FTHR is. max effort 100km will generally sit aorund HIMHR or slightly above (5bpm). I find Phil Maffetones 180 - minus your age to be a good measure of where you should be riding an IM bike. This should be your HR cap. If you are advanced +5 to that number. If fairly new possibly even cap it at 5 below that number. I did my longest ride today. 151.5 km in 6:11. About 2 hours and 50 km longer than my previous best, which was set 1 year and 1 week ago. how did the bike feel after that time? Sore arms (biceps), sore back, sore feet, and sore shoulders/neck. Dave Tyno wrote: I did my longest ride today. 151.5 km in 6:11. Thats a huge step up Mate. Very well done. I didn't realise it until I went through my entire history on Triathlog, but last week was my biggest training week, time wise. Thanks in large part to the 6 hours on the bike yesterday, I ended up with 15 hours last week. Dave Tyno wrote: I didn't realise it until I went through my entire history on Triathlog, but last week was my biggest training week, time wise. Thanks in large part to the 6 hours on the bike yesterday, I ended up with 15 hours last week. Last week was the first week of this IM prep that I didn't get in at least 3 swims. I did a 'business house relay' on Tuesday which was just a bit of fun, but importantly I got a feel for trying to swim consistent fast laps (40 secs for me). So Sunday afternoon came around and I was feeling bad about not swimming much this week. Decided to go down to the pool and knock out a 1,500m TT to see where things are at 2 weeks out from IM. Felt good and strong from the start. I take splits each 500m and was really happy with the consistency. I'm pretty sure my PB is around 27:30, and the fastest this year was 27:50. I was stoked to hit the wall in 26:25! At least a minute off the PB! After going 30 seconds either side of 1:10 in my 2 previous IM's I'm now looking to go closer to 1:05. BRING IT ON! I improved my bike PB to 170.2 kms and 6:54.02. Made it 10km further up the hill than I did last time.